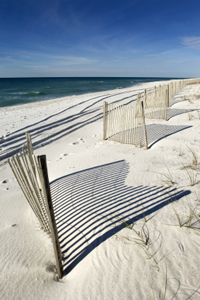 The history of the Gulf Shores area can be traced back for many centuries. This is truly a story that is worth hearing as it tells of the generosity, team effort, and dedication that is commonly displayed throughout the city even today. Original settlers to this area include the Creek, Choctaw, Chickasaw, and Cherokee Native Americans. Artifacts supporting the lifestyles of these early residents can be seen throughout the museums in the area. In the early 1500s' traveling Spaniards came to the area now known as Gulf Springs. These visitors constructed the original Fort Morgan. The fort was rebuilt in the 1800s' and played an important role in the Civil War. Another nearby fort, Fort Gaines, was also used during this time. These prominent sites were the setting for raging battles that took place between the Union and Confederate soldiers. These naval forces were fighting to gain use of the harbor entrance which still is in use today. Visitors can take a step back into time and enjoy a visit to both Fort Gaines and Fort Morgan. During October and May of each year Fort Gaines offers visitors the opportunity to see re-enactments of real battles that raged on in the area. In 1937, the completion of the Intracoastal Waterway attracted people to Gulf Shores. It was shortly afterward in 1939 when the Gulf State Park was opened and people began to take notice of all that the area had to offer. Prior to this time the population of Gulf Shores was very sparse, with the area having a reputation for being a small fishing community. People quickly found that with the Intracoastal Waterway in place residents and business owners realized the possibilities that the Town of Gulf Shores had to offer. They began to take advantage of the travel, import, and export opportunities that were right in front of them and this is how the area began to truly grow. No one can really appreciate the history of Gulf Shores without hearing of the Gulf Shores Museum and the story about how it came to be. The Gulf Shores Museum was originally constructed as a beach house for the family of Valerie Cole who lived in Mobile, Alabama. The house was built and located in West Beach but was later moved to Gulf Shores following Hurricane Frederic in 1979. The home was donated by the Cole family and has been used as the area's library, youth center, and now the Gulf Shores Museum. The site in which the museum now sits was land donated by Wade and Pat Ward, as well as Claude O'Connor. The steeple that is situated on the Gulf Shores Museum is just another example of the generosity found throughout the area. This steeple was donated by the Oyster Bay Baptist Church in 1999 offering a place to watch over the garden. Not all events that took place to mold the history of Gulf Shores, Alabama were welcoming. In 1979 Hurricane Fredric hit the Gulf Shores area head on and cause serious devastation for the residents and business owners alike. The entire beachfront area of Gulf Shores was destroyed and had to be rebuilt. This did ignite the massive construction boom in which many business headquarters, condominiums, retail centers, and restaurants in the area were born. This is also the time in which it was decided that the town would become known as the City of Gulf Shores. Other storms that have since cause damage to the Gulf Shores area include Hurricane Ivan in September of 2004. During the rebuilding process following this storm the area would be hit simultaneously Hurricane Dennis and Hurricane Katrina which both took place in 2005. The amount of damages caused during these two storms was less severe than other areas along the coast that were affected. Today residents and business owners do not see any reminders of the storm except for the heighted storm protective barriers that have been incorporated into the area. People are free to enjoy the beaches, local art centers, retail outlets, parks, library, museum, and other interesting venues that are situated around the City of Gulf Shores. However, to fully appreciate all of the amenities that are found throughout the area understanding the city's rich history and culture are a necessity.